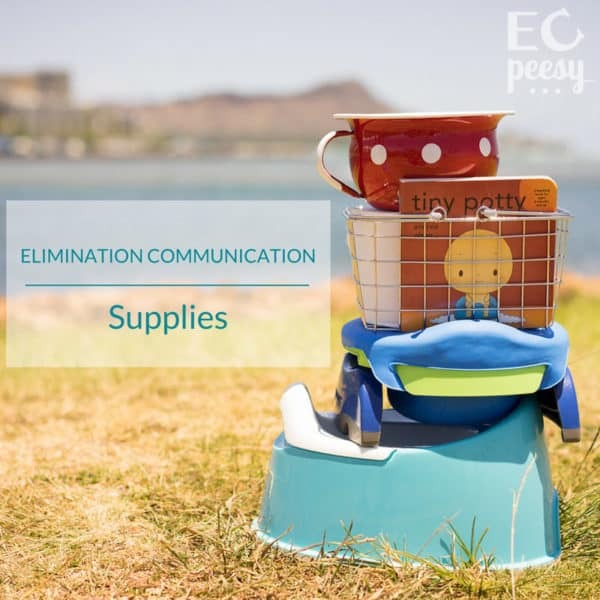 We switched which elimination communication backup and supplies my daughter was using when she was three-months-old, so I figured we should provide an update. (It took me a while to publish this post - life has been busy!) To see what we had been using up until this point, see my post on practicing Elimination Communication with a Newborn from Birth. 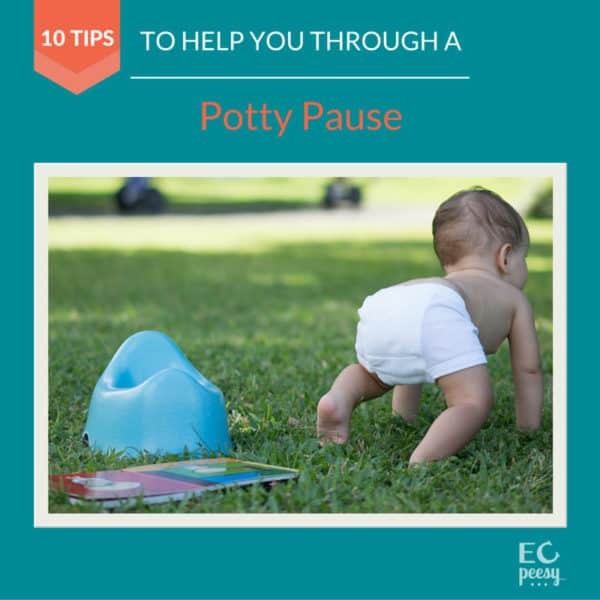 When my daughter outgrew the top hat potty we switched to using the Potette Plus 2-in-1 Travel Potty with reusable liner. (Shown in the photo at the top of this post.) The main reason we switched to the Potette was because we still had my son's old one. He had mostly used it during the toddler years. My daughter is a chubbier baby and when the reusable liner is inside the potty I can hold her on it without her falling in. However, the round shape of the Potette does not allow her to put her feet down flat. For a while we were using the Potette Plus both at home and when we'd go out. That made it difficult to pack the diaper bag, since I normally offer the potty one last time right before leaving the house. 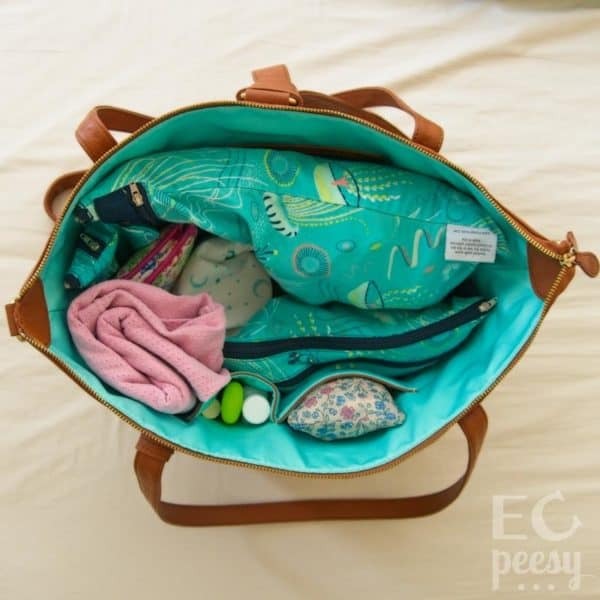 And when we would return home I would have to scramble to get the potty out of the diaper bag and set it up to use right away. We soon realized we needed a second potty to use solely at home. 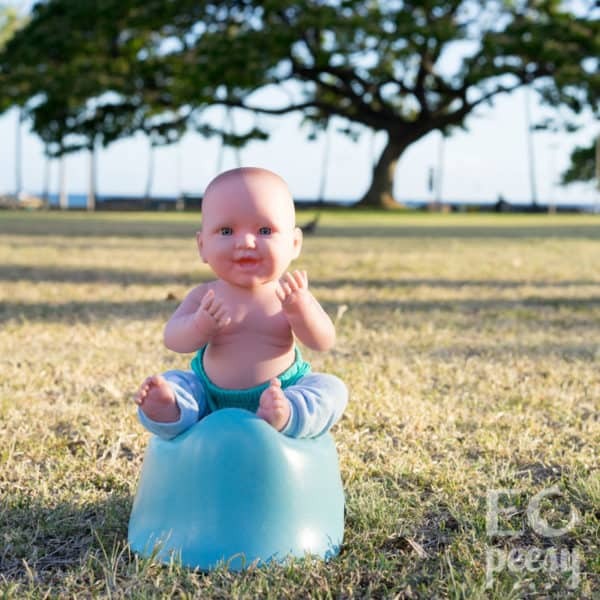 At the end of her third month we got the BecoPotty, which is made from biodegradable plant based plastic. Unfortunately, this potty is no longer being manufactured. We ordered one of the last ones from Amazon USA (actually, two of the remaining potties but the first one was shipped in a thin bag and arrived smashed to pieces!). The BecoPotty was expensive, but it was worth it to me, since it is the perfect size for her! 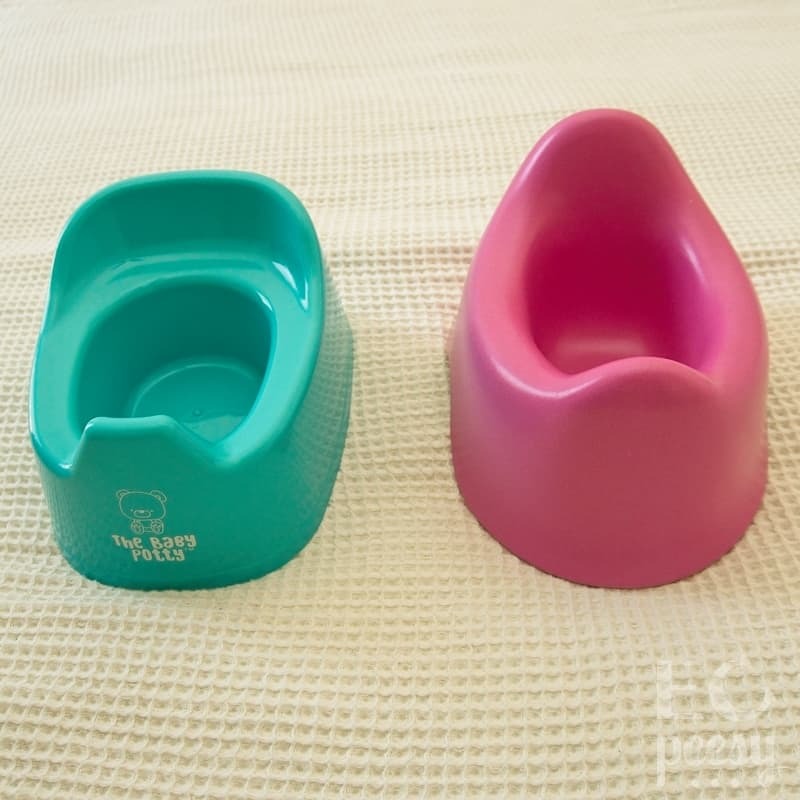 Update: If you are looking for a similar sized small potty, The Baby Potty - Mini Potty from Tiny Undies is a similar size and even shorter. Here's what's on our diaper cart at 3-months-old. 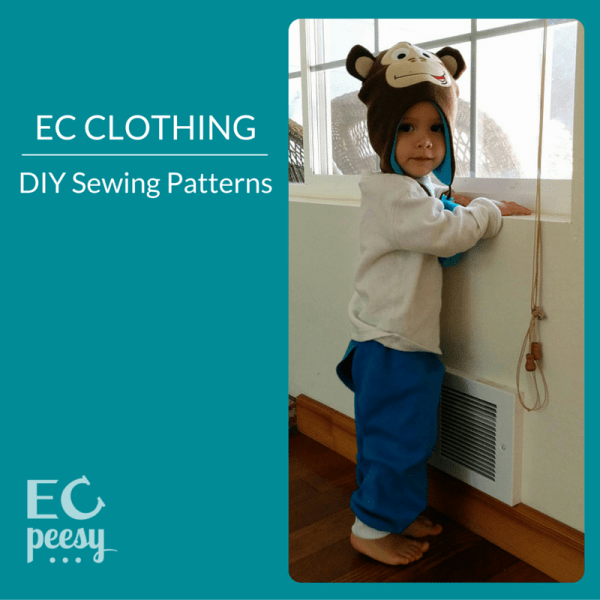 When my daughter outgrew her newborn Cloth-eez Workhorse diapers I had to scramble to find something to replace them. Originally, I had been planning to use Loveybums-in-Ones along side our Flaparaps. Since the NB/S Loveybums-in-Ones didn't work out for us, I had to find another alternative. I decided to try out Tiny Trainers cotton training pants a little sooner than I had originally planned. Another mom in one of the elimination communication Facebook support groups mentioned that her 3-month-old was outgrowing size 6M Tiny Trainers. It made me take a closer look at the size chart. I decided to order three packs of Tiny Trainers in size 12M and one pack in size 18M. My daughter has a big waist and chubby thighs. The size 12M fit well around her waist, but didn't have much growing room around her legs, especially since the leg openings are not very stretchy. The size 18M were a bit too big around the waist but gave her a bit more growing room around her legs. I should mention that the instructions say to wash Tiny Trainers on cold, but I ran them through the hot wash with the Flaparap pads, so they shrunk some. To me it doesn't make sense to require training pants to be washed on cold when they still need to be cleaned as thoroughly as diapers. This stash of 12 Tiny Trainers replaced 24 fitted diapers. Luckily, at this point she is not constantly farting poop dots, so we are not going through as many backups per day. My plan was to have her wear Tiny Trainers under wool shorts, but it turned out that we mostly used the Tiny Trainers at home without a cover and used Flaparaps for going out. I would let my baby lay on her wool changing pad from Little Bunny Bear while wearing training pants, since they aren't waterproof. Tiny Trainers have more absorbency than any of the other 100% cotton training pants that I've tried, and I've tried most of them! Along with Tiny Trainers, we have started testing out a dozen other brands of cloth training pants, for a massive cloth training pants comparison review. Note: The Flaparaps shop will be closing at the end of February 2019. I am so sad about this, since they are awesome backup for EC. We have also been using Flaparaps when we want a waterproof backup. I was hesitant to start using them at first, but I loved them as soon as I dove in and tried them! I think I got intimidated by Flaparaps when I first tried them on my tiny newborn baby. She was swimming in the shells. Now the Flaparaps seem to fit her just right. We have four shells (2 quick dry, 1 cotton, and 1 wool). I was able to buy a used wool Flaparap shell, and I'm so glad I did. It's my favorite. I save it for nighttime use since I only have one, but I'd be happy to use wool ones during the day too. 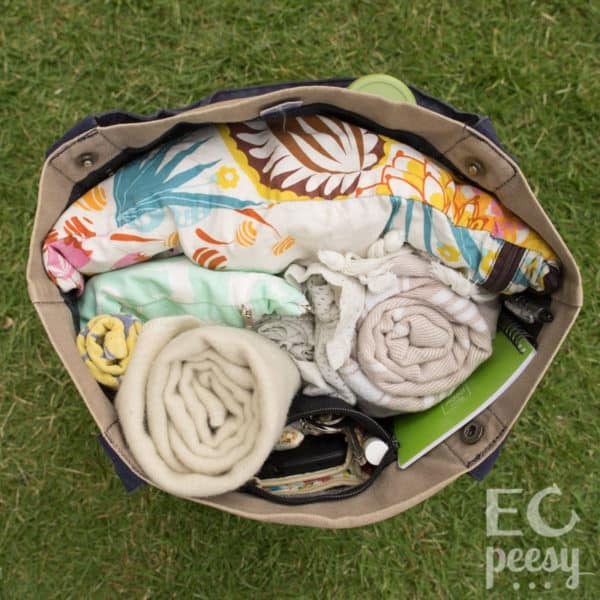 The wool doesn't get smelly the way the quick-dry polyester shells can when the same shell is reused all day. And the wool is breathable so it doesn't trap sweat. 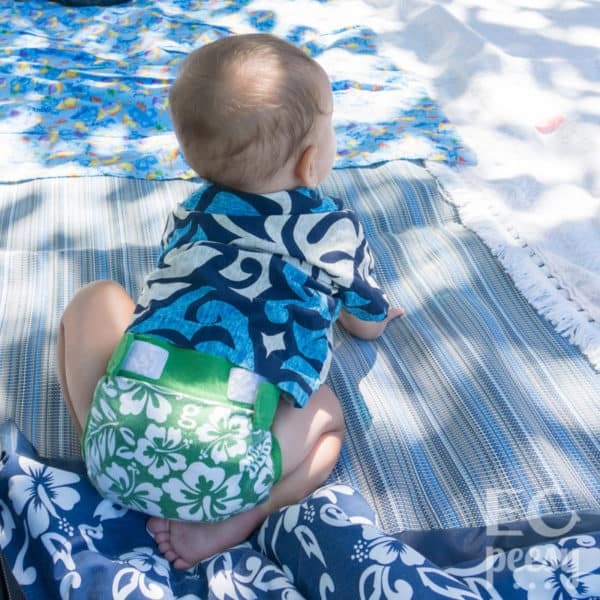 I especially like the breathability at night, since it is hot where we live and our kids sometimes get heat rash at night, even when wearing just a cloth diaper! We have 12 size small organic pads and 6 size large organic pads. I like the large size for nighttime, since I often miss a pee and end up changing a wet pad. If we had more Flaparap pads, we could have used these as our only backup at this stage. But it is nice having one waterproof option and one non-waterproof option when I want to be able to see immediately when she has peed. Our baby girls is just about 12-weeks old. Technically, she will be 3-months-old on August 9th, but developmentally, she's not a newborn any more! We tried Flaparaps (or "Flapa-dapa-dupies" as I like to call them) for part of the day. This time we caught two big poops in the potty instead of in the Flaparap. The Tiny Trainers arrived! I can't wait to wash and try 12M size on her. I also bought her an up-cycled wool skirtie. My husband much prefers the trim Flaparaps for mobility compared to the bulky fitted diapers. Baby always tries to roll over when I lay her down and she is more mobile in the Flaparaps or trainers than the fitted diapers. Sometimes she's successful at rolling onto her belly but she ends up with one arm stuck under her. She looks so cute in the 12M Tiny Trainers! We already had a small poop miss in them, but it wasn't a big deal pulling them down. We had our first dry night last night! At her 1:30 am nursing her diaper was dry. But she was mostly asleep, so I didn't offer the potty. At 3 am we caught a pee, and at 6 am and 6:40 am we caught pee and poop. Honestly, I haven't been doing much nighttime EC with this baby. I don't nurse her on the potty like I did with my son, so it's harder to offer the potty at night. We've been on a roll with catching the morning poops in the potty around 6-7 am. Yesterday we also caught other poops throughout the day. She has been pooping a lot lately. We've made the transition to Flaparaps and trainers. We were forced to, since she had really outgrown the newborn fitted diapers. We could use about 12 more trainers. Still waiting on wool shorts. I really like Flaparaps, especially at night. They are my favorite nighttime backup since I don't have to mess with snaps or Velcro. My 3-month-old baby talks! Sometimes she says "I'm wet" and every time she has said it, it's been true! Today g was watching her and he heard her say "I'm wet". He checked and sure enough, her trainers and the prefold she was laying on were wet. A couple times she said "I pooped" and when I checked she had a little poop in her trainers or Flaparap and then did a poop on the potty. Her main word is "hungry" which she says when she is really tired and needs a nap or at bedtime. Her first word was "girl" probably just imitating what we say to her. Update: After these words at such a young age, she stopped talking while working on her gross motor skills of crawling and cruising. Once she was walking at 8-months-old she started talking again with "Hi, all done, Dada, Brother". For the past couple days she has been telling me she needs to poop by blowing raspberries. There were a couple days we were playing around blowing raspberries at each other. But the following day I realized she was doing it in association with pooping. The sound is similar to the sound when she poops. I am amazed that she might really be telling me when she needs to poop! I will keep offering when she tells me and see how it goes. I put the wool Flaparap on her today and I love it! There's just something about soft snuggly wool. The size medium wool bubble shorts from Rainy Day Woolies also fit her. The waist band is perfect. The leg holes are loose, but that's okay since she will grow into them. I'm still so sad that the Truly Charis XS lilac bubble shorts are too small on her. I should have asked if there was enough fabric to make size small. This morning my sister brought Baby to me saying that she was blowing raspberries and might need to poop. Baby had a little bit of poop in her trainers and pooped in the potty. My sister was amazed that a 3-month-old had told her she needed to poop! 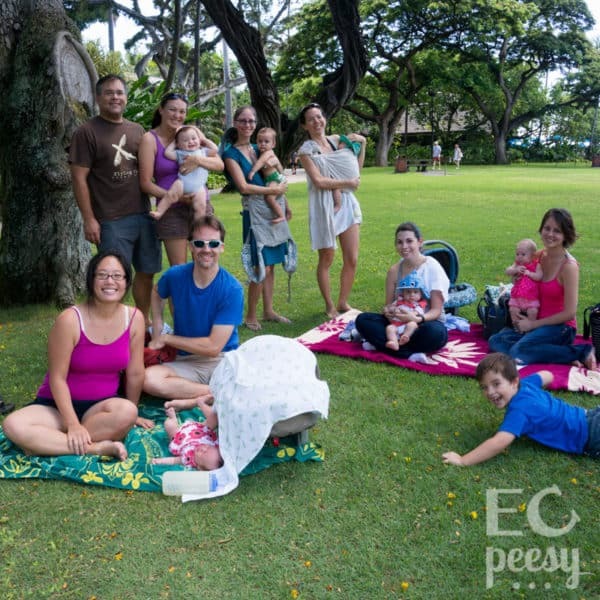 We spent the day at the Bishop museum and Baby told me a couple times she needed to poop, but she wouldn't poop while held over the toilet in the EC hold. Next time I need to bring her potty! She spent half the bus ride home blowing raspberries so hard she was spitting everywhere. I kept telling her that I heard her and we were almost home. When we finally got home she nursed and pooped in her potty. It's good to be home! Today Baby was constantly blowing raspberries, so I couldn't tell when she needed to potty. Maybe because I was concentrating on something I needed to complete and she figured out that blowing raspberries was a good way to get her dad's attention. Baby used the Potette Plus on a public toilet for the first time! She peed like a champ and didn't get too scared of the bathroom stall. It was crazy crowded at the Okinawa Festival and I didn't want to make a big scene by pottying her on the changing table. So I put the Potette Plus on the big toilet after putting down a toilet seat protector. She has been blowing raspberries for both pee and poop, she especially does it right after using the potty. One day she blew raspberries all day, which was super confusing with lots of mis-guesses. Seemed like she had figured out a clever way to get picked up. She doesn't like pooping away from home. There might be some skid marks or poop dots in her diaper, but she waits until we get home to poop on the potty. Our routine is to offer before nursing to catch pee and after nursing to catch poop. Also around 5am to catch poop. 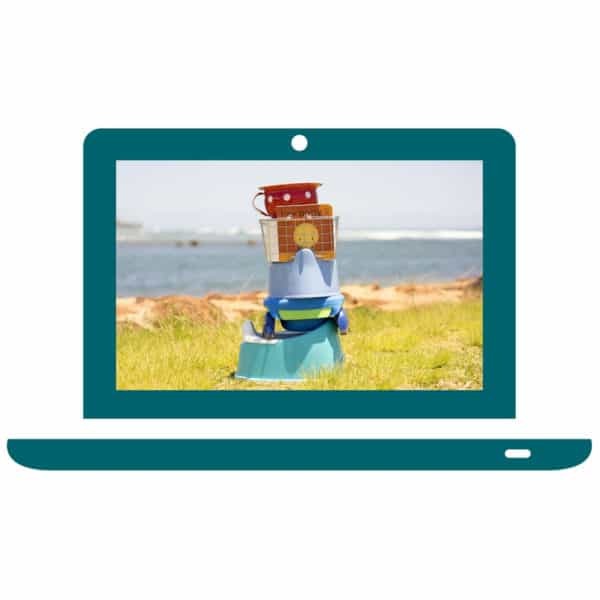 No more blowing raspberries or fussing as signals. She doesn't really signal these days. Sometimes she looks like she's trying to walk to me when she has to pee and someone else is holding her. Other than that, not much signaling. She is usually always wet at her first nighttime wake up. Sometimes we catch 1-2 pees between 3am and 6am, plus early morning poop around 5-6am. That's it for practicing EC with a three-month-old. You may want to check out our Coupons Page for discounts on training pants and more! 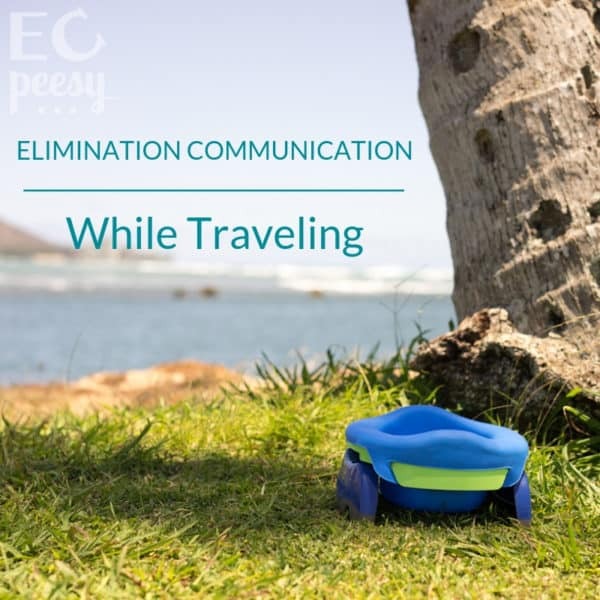 Are you practicing elimination communication with a 3-month-old baby? How is it going for you?